Macular degeneration is a common eye condition that can render you virtually-blind with time. Luckily, with today’s technology, there are a variety of treatment options to help save your sight. Photodynamic therapy for macular degeneration is a procedure that cannot reverse lost vision but can prevent possible future damage. To find out if photodynamic therapy could be right for you, read below where you’ll find everything you need to know about this procedure and how it could affect you. This type of medical treatment uses a photosensitizing molecule and a light source to activate the specific, photosensitizing drug that has been administered. This medication concentrates (or clusters) only in certain cells. The light source is then used to target these cell-clusters. Photodynamic therapy for macular degeneration is a special treatment for the eyes. It uses the unique medicine and light-source to help reduce the effects of macular degeneration. When you have macular degeneration, your macular is damaged. “The macula is the sensitive, central part of your retina.” The retina is responsible for converting light into electrical signals and sending those signals to your brain. When an essential part of your retina is damaged (the macula), your central vision can become affected. During macular degeneration, the macula could become thinner, blood vessels could begin growing beneath the retina, and fluid can start to leak from your macula. All of this can eventually cause loss of vision. Photodynamic therapy cannot restore any vision that has been lost but can slow down and prevent future damage. Who Is the Procedure Right for? Photodynamic therapy is just one type of treatment for macular degeneration. Since there are two main types of macular degeneration, wet and dry, there are various forms of treatments for both. Photodynamic therapy is only recommended for wet macular degeneration, as abnormal blood vessel growth is only present in that type. While macular degeneration can technically happen at any age, it is more common in those above the age of 50. Genetics and other factors can play strong roles in the possibility of developing macular degeneration. Your doctor may recommend this treatment if your vision loss is gradual and not sudden. The doctor will also take into account your current health, age, and other factors. This treatment is a relatively simple procedure, which can be done in a doctor’s office or other outpatient setting. When you go in for photodynamic therapy for macular degeneration, you will be prepped. This preparation includes receiving an injection of medicine; usually through an IV in the arm. The medicine is crafted to be sensitive to certain types of light, and it works by gathering or collecting itself in the damaged, or abnormal cells in your retina. After the injection, a doctor applies an anesthetic to your eye, in the form of eye-drops. You may also be given medication to help you relax. The doctor shines a special laser into the eye using a unique contact lens. The light then activates the medicine, which creates clots of blood where the abnormal, or damaged blood vessels exist. These clots seal off the effected vessels and prevent additional loss of vision. The entire procedure should last around 25 minutes, but it can be longer depending on the damage. 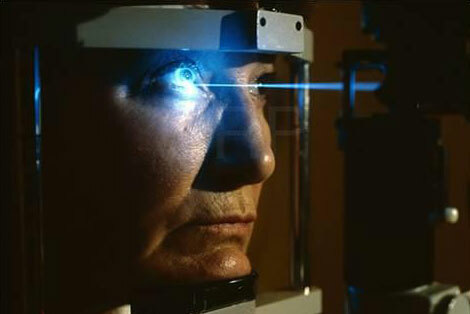 The laser-light is applied to your eye for short periods of time. The laser itself is invisible and completely painless. As this is an outpatient procedure, you should be able to go home the same day. Someone should be with you for the first day or two after photodynamic therapy. Your eyes and skin will be more sensitive to light for a few days following the procedure, so it’s important to avoid sunlight and stay indoors. Your doctor will let you know when it is safe to expose yourself to the sun or light again. You will follow-up with your doctor shortly after the procedure, and he/she will continue to monitor your symptoms and progress. Visual disturbances (decreased vision, visual-field defects, etc. ); though these are most-often temporary. Pain in the back; related to the medicine-injection. Reactions on the skin where the medicine is injected. Increased risk of photosensitivity reactions, like sunburn. The loss of sharpness in your vision, though it is often temporary and rarely severe. How Effective Is Photodynamic Therapy for Macular Degeneration? It is important to understand that photodynamic therapy for macular degeneration does not reverse any loss of vision. The procedure can only prevent your vision from worsening. There is no cure for macular degeneration. Some doctors find this procedure to be more effective, and less destructive, than other types of procedures, since it is better able to target specific blood vessels without damaging other cells in the macula and retina. Photodynamic therapy lowers the risk of having severe vision loss because it reduces the growth of those abnormal cells that inhibit your central vision. The specific effectiveness of the procedure varies by patient. The effectiveness will depend on how the blood vessels are growing and where they are growing. In fact, some people will experience new macula-leaking around 3 months following the procedure. Because of this, many people require multiple treatments to reap the full benefits. If you’re considering getting photodynamic therapy for macular degeneration, it is essential to consult your physician first. Together you can discuss your medical history, current vision-loss, and the risks and benefits associated with the procedure, to decide if it is the right option for you. Photodynamic therapy can slow the progress of vision-loss and help you gain back control of your macular degeneration.